Review: 2013-04-20, some good exchanges in the second part of the fight but the bout between Brian Rose and Joachim Alcine was not so exciting: it gets two stars. Brian Rose (22-1-1, 6 KOs) entered as the No.19 light middleweight in the world while Joachim Alcine (33-3-1, KOs 19) entered as the No.24. 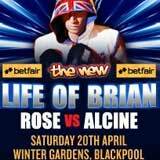 Rose vs Alcine is valid for the vacant WBO Inter-Continental light middleweight title. Watch the video!